Get ready to spend a nostalgic evening saluting three of the world’s most beloved musical groups – groups who were instrumental in creating the Rock & Roll Doo Wop sound. Come and hear three great acts in a grand 1950’s -1960’s style tour de force that pays homage to the groups that created America’s enduring musical heritage. The Real Living Legends of American Music, The Drifters, The Platters and The Coasters, were the epitome of the classic sounds of the 50’s and 60’s. The Coasters perform showcasing their string of hits. The Platters who recorded over 350 songs and have sold over 80 million records. The Drifters recorded for Atlantic Records over three decades. During the 1950s and 1960s, The Drifters enjoyed the majority of their recorded success with hit after hit including “Under The Boardwalk”, “On Broadway”, “This Magic Moment”, “Up On The Roof”, and “Save The Last Dance For Me”. There are only two living members who recorded with The Drifters on Atlantic Records. Rick Sheppard is one of those two legendary members. Anyone else who claims he recorded with The Drifters in the 1960s for Atlantic Records or any group performing as The Drifters claiming a direct link to Atlantic Records in the 1960s is simply not telling the truth. Now, as then, The Drifters featuring Rick Sheppard continue to perform the classic Drifters repertoire with energy, style, and a high degree of professionalism. They are the embodiment of pop music (no, not doowop, but pop music) at its finest. Come hear The Coasters sing their hits: “Young Blood”, “Charlie Brown”, “Poison Ivy”, “Yakety YaK”, “Along Came Jones” among many others. Come hear Platters hits: “The Great Pretender”, “Smoke Gets In Your Eyes”, “Only You”, “The Magic Touch”, and “With This Ring” among many others. 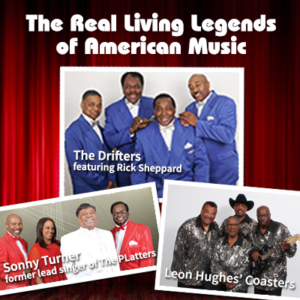 THE DRIFTERS…one of Rock & Roll’s founding vocal groups that is again touring North America under the leadership of lead vocalist Rick Sheppard. “Up On The Roof”, “Under The Boardwalk”, “This Magifc Moment”, “There Goes My Baby”, and “Dance With Me”, the list goes on and on. They were the first group to sell two million single records with their pop classic, “Up On The Roof”. They were among the first inductees in the Rock & Roll Hall of Fame. Their classic,”Under The Boardwalk” is one of the most played recordings of all time. Built around the talents of legendary lead singer Sonny turner, the group captures the essence of the classic Rock & Roll ballad. In late 1959, Sonny Turner replaced Tony Williams as the lead singer of the original Platters. Chosen out of 100 singers who auditioned, Sonny at the young age of 19, toured the world with “The Platters” bringing their music to people around the world. More than forty years after the Coasters stormed the pop and R ‘n’ B charts with their first million seller, “Searchin’,” the Coaster’s show is a nostalgic treat for the senses and has proven to be as exciting today as they were in the fifties. The greatest honour of all was the choice of the Coasters as the first group inducted into the Rock and Roll Hall of Fame in 1987. Poison Ivy, Baby That Is Rock & Roll, Yakety Yak, Zing Went The Strings of My Heart, Searching, Smokey Joe’s Cafe, Love Potion #9, and many more.